School and Course Reps are the link between the students and staff in all of the Schools in Queen’s. They listen to the views, opinions and suggestions of students and feed these back to University staff members. They work hard to improve their fellow students’ time at Queen’s by making the changes they want to see happen. Each School at Queen’s has one School Rep, they are elected by their fellow students every year. School Reps the vital link between the students and staff. They listen to students’ views and feed these back to staff members and make the changes that students want happen. Each year of each course at Queen's has its own Course Rep, they are elected by their fellow students every year - there are over 570 in total. 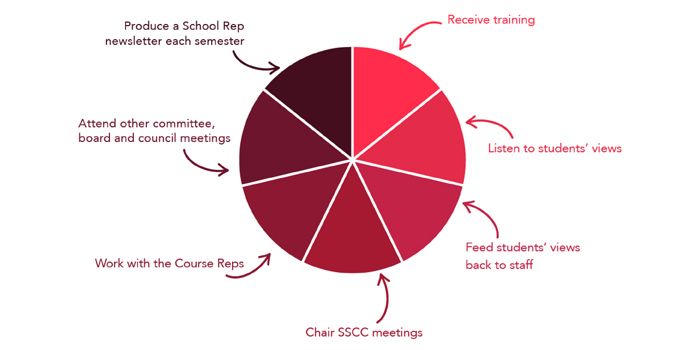 Course Reps are the link between the students and staff. They listen to students' views and feed these back to staff members and make the changes that students want happen. If you are interested in finding out more about being a School or Course Rep, please visit our Become a Student Rep pages or contact the Student Voice Team who can advise you in confidence.